Home / Dental Health Advice / How to enjoy Easter without becoming a chocolate fiend! Easter is fast approaching and for most of us and especially our children, chocolate will probably feature and maybe in excess too! We all want some fun and we don’t want to dampen your enjoyment so how can we help keep your teeth protected yet still participate? It is still frequency of sugar intake that is our biggest concern. Sweets and chocolate consumed over many hours will do more damage to teeth than when consumed in one short sitting. Does this mean it may be better to eat it all at once? In many ways yes but you probably face the issue of sickliness then! It is certainly a good idea to allocate a time of the day to eating chocolate and sweets. After a meal is certainly when the least damage can be done. There will be a sugar and acid surge anyway after a meal so a few more sweets at that time will do less damage than waiting for an hour until the sugar has been neutralised. What about cleaning after brushing, surely that protects the teeth? It would seem that this could be a good idea but it isn’t always the case. After eating sweet foods and treats, teeth can have some of the hard matrix dissolved by acids. You can’t see this and after an hour of no food in the mouth your saliva will neutralise these acids and replenish the matrix. However, if at that point, straight after eating, you brush your teeth, you could actually brush away some of this softened matrix. This causes erosion of the teeth and is a particular problem we see especially with teenagers who drink a lot of fizzy and diet drinks. Therefore brushing teeth straight after eating sweets and chocolate may not be a great idea. After we have eaten food, sweets or chocolate, the body will naturally neutralise the acids that bacteria have produced or from the foodstuffs. It varies person to person as to how long this takes but usually around an hour. If in that hour you have some more sweets or food or drink then you will experience another acid surge and then will have to wait another hour for neutralisation. If you continue to snack then you can start to see the danger your teeth are in, they are under constant acid attack and therefore prone to tooth decay. If you can then do limit the amount of chocolate and sweets your children have at Easter. Perhaps ask relatives to give toys instead? Plan an Easter Egg hunt with a difference, perhaps with clues or toys? 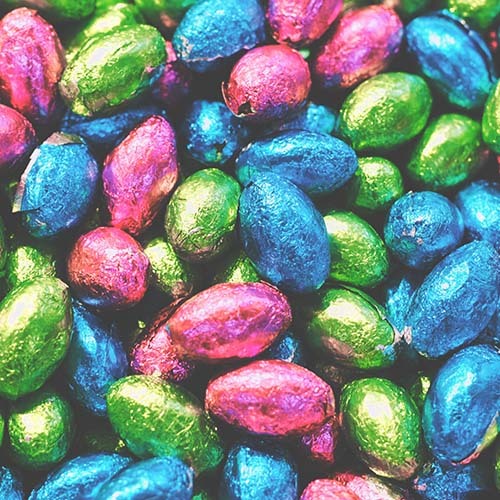 Ration chocolate eggs and eat after a main meal to reduce potential damage to teeth. Always clean teeth twice a day but maybe not after every time you have sweets or chocolate. Arrange regular check ups for your children, at least twice a year and don’t wait until they have problems, prevention is far better than cure. We hope you have a great Easter and by following some of our guidance hopefully you can help protect your children’s teeth too. For more information on how to take care of your teeth during Easter or to book an appointment please call the practice on 0161 928 0014.